Preheat oven to 375°C/190°F. Grease a 9x13-inch baking dish. Set aside. To make the filling: In a large bowl, toss peaches with lemon juice. Add all other ingredients and toss evenly to coat. Transfer mixture to prepared baking dish and spread evenly. Set aside. To make the topping: Place flour, sugar, baking powder, baking soda, and salt in a medium bowl and mix to combine. Add butter and crumble the ingredients in a bowl using a pastry cutter, your fingertips, or a fork until it resembles coarse meal and there are no longer large pieces of butter. Add buttermilk and vanilla and mix until evenly combined (I use a wooden spoon). Place large spoonfuls of dough over the filling in the baking dish and then gently flatten them. It doesn't need to be perfect, some of the filling can be showing, and it will spread during baking. Lightly brush the dough with cream or milk and sprinkle with sugar. Bake for 40-45 minutes, until juices are bubbling, and a toothpick inserted into the biscuit topping comes out clean. The topping should be golden brown, but if it browns too much while baking and the topping is still not cooked through, cover the baking dish loosely with aluminium foil. Allow to cool for a few minutes on a wire rack until warm. Serve warm with ice cream or whipped cream. 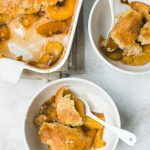 The cobbler is best on the first day it’s made, when the topping is still crispy.